Freebie Finding Mom’s beauty guru Allyssa shares one of her frugal beauty secrets: Using coconut oil on hair to get beautiful and healthy locks. You’re probably already familiar with the numerous beauty and health benefits of coconut oil…and if not, where have you been? 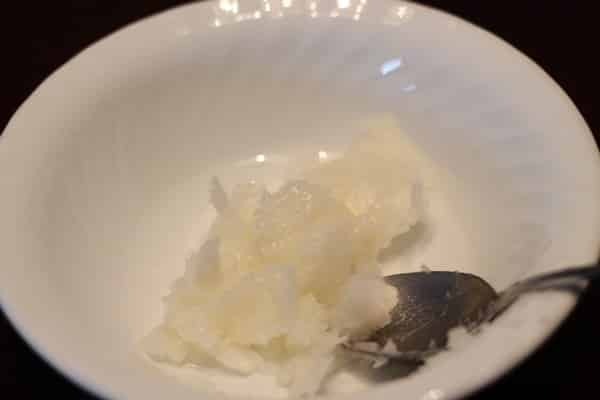 🙂 Coconut oil is great for everything from losing weight to treating acne and preventing wrinkles. In fact, there’s practically no end to the health benefits of coconut oil. Today, let’s look at how using coconut oil on hair will produce luxurious locks that’ll be the envy of everyone around you! For a cheap and easy DIY hair mask, all you need is coconut oil (which you can buy on Amazon.com) and extra virgin olive oil. Using coconut oil on hair (and extra virgin olive oil) will keep your hair soft and moisturized. It’s especially great in the winter. 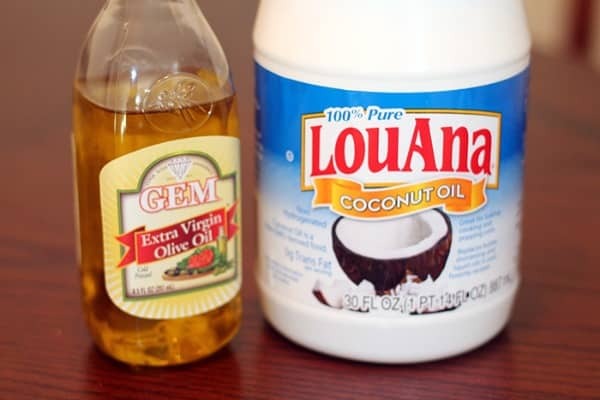 Here are the super simple steps to using coconut oil on hair and a few pro tips. 1. Start off with 3 tablespoons of coconut oil. 2. 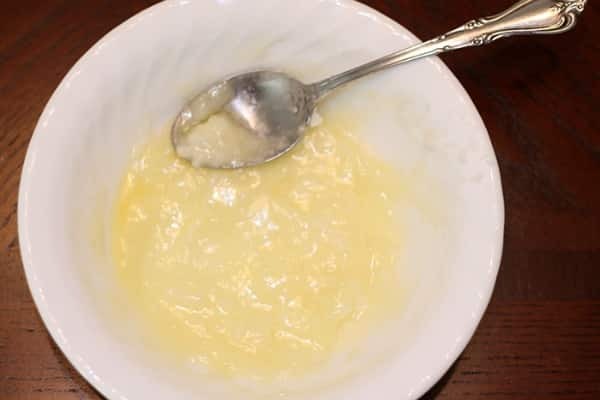 Mash the coconut oil into the bottom of a bowl. 3. Add 1 tablespoon of extra virgin olive oil. 4. Mix the coconut oil and extra virgin olive oil together until you get a paste consistency. 5. Apply mask for super soft and moisturized hair. For more DIY beauty tips, follow Freebie Finding Mom’s Beauty Tips Pinterest board. – I prefer using coconut oil on hair from about mid-way down to the ends because that tends to be the portion that is damaged and needs some care. I don’t put the mask on my scalp because it tends to make my hair feel greasy; however, if you have very dry hair or frizzy hair using coconut oil on hair towards the scalp can do wonders. – For the best results, leave the mask on overnight. Be sure to put a towel or some kind of protective covering on your pillow! If this isn’t an option, try to leave the mask on for at least an hour. – For best results when using coconut oil on hair, put a shower cap over your head and blast your hair with a blow dryer on warm for 20 to 30 minutes. – When it’s time to remove the mask, break out the shampoo. You’ll definitely want to shampoo everywhere the mask has been. Oil and water separate, so the shampoo is necessary to remove the oils. If you simply try to wash the mask out with water, you’ll be left with a greasy filmy residue. – The great thing about using coconut oil on hair is that you can’t really overdo it. To start out, try using this mask every other day. Once you start noticing a difference in your hair (trust me, it’ll be quick, probably after the first week), cut back little by little. Eventually, you should only need to use coconut oil on hair once a week in order to maintain your movie star worthy locks. I hope you enjoy this coconut mask tutorial. It’s cheap, easy, and beats any restorative hair mask from the drug store. Try using coconut oil on your hair today…you’ll be amazed. Do you have tips on using coconut oil on hair? if so, share them in the comments. Also feel free to share before and after pics. I have been putting straight coconut oil on my hair fro about 6 months, once a week. I have very fine hair that I color and put a body wave perm in once a year. I could never get my hair to grow out, as it would get frizzy on the ends cue to damage. I am so happy to see it is finally growing and in great condition. I attribute this to the coconut oil use. Do you have to put the EVOO in the mask or can you just do straight coconut oil? If you use a microwave on these natural oils or essential oils it will burn out the vitamins and awesome properties. You should always do a double boiler. It may take a little longer but it’s worth the time as you will see more of the benefits of the coconut oil on your hair. I used coconut oil evoo and little bit of honey!! Over processed hair bleached and dyed and now it feels awesome!! Coconut oil is amazing and affordable! I started using it about a week and a half ago about 3x a week and I’ve already noticed a difference! I tried this and the results are great. 🙂 Now I’m sending this post to my friends, they have to see it too. Thanks! 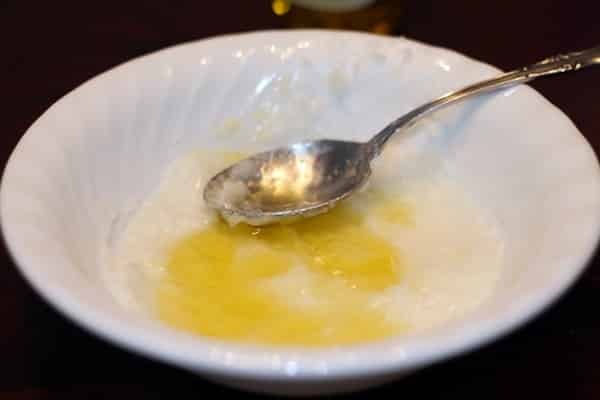 Coconut oil is amazing and it can do incredible things for your hair, skin and body. I love this post and even though I already do this, I do it a slightly different way so I will be sure to utilize your tips. Awesome idea! That’s awesome that you love using coconut oil on your hair too! do you use the coconut oil in the grocery section or the pharmacy section? I find it in the grocery section near the cooking oils and sprays. You can also add peppermint essential oil and apply the mixture to the roots to stimulate hair growth. I do this every two days and every other time, I add the peppermint. It feels nice and tingly and is awesome if you’re trying to grow your hair fast. I’ve used this many years, before it became ‘popular’. It really works ! Occasionally, I switch up and add in avocado. Hint : when using coconut oil be careful with it going down any drain…it becomes solid again and can make your drain run slow…rinse the drain through with very hot running water. I have thick, curly hair and it stays hydrated and shiny. I put the coconut/olive oil mixture from my roots to my ends. I put it on as early in the day as I can and leave on all to a good par of the day. I can’t sleep with my hair up so I don’t not do this at night. IT takes me two washes to get all the oil out. I love how it feels afterwards. I love how soft it feels. I also use the corresponding conditioner to the shampoo that I use and absolutely love the softness I get this way. If you add the shampoo directly before putting water on it will wash out easier. Also coconut oil goes very far so try putting on less. Coconut is produced by many brands and is commonly available in various grocery, food and health stores. It is very good for reconditioning dry hair and damaged hair because of its better molecular structure compared to other plant oils.Regular users of the coconut oil say that it makes their hair shiny, strong and they report less hair loss, split ends and breakage.Thanks fro sharing. Looking forward to trying this. I have very fine, straight, color-treated hair. It is limp but still managed to frizz out on the ends and won’t hold a curl to save my soul. It currently falls just to my shoulder blades but I’d love to see it reach the middle of my back. I stumbled across this while looking for a DIY sea salt texturizer and now plan to use both products! I’ll keep you posted! I am 73 years 0ld and have been using Coconut Oil on my hair for the past 15 to 20 years. I gave my age because I have very little gray and my hair is thin (always has been). By accident one day, I rubbed my face with what was still on my hand, Skin was slightly greasy, but not too much, and I have very few wrinkles. Recently I noticed the beginning of “chicken neck,” I rubbed some coconut oil on my neck and began to see the difference in less than a week. Yes, still there but not as noticeable as they were. Sometimes before shampooing, I will warm up the Coconut Oil, part my hair put the coconut oil in the part, then put a hot towel on my hair, helped it to grow after a bad hair cut. Not sure if the results are genetics or the Coconut Oil. But I swear by it. The coconut oil needs to be COLD PRESSED AND UNREFINED or you won’t get any benefit from it. I have always taken really good care of my hair and skin after seeing firsthand what sun damage, neglect, etc did to my mother’s. We were very poor, therefore, my mother was forced to work like a man on the farm. She did the same work the men did and worked as hard as they did. She worked in the fields from daylight to dark with no thought to her hair or skin. After I had my children their friends, especially my daughters’ friends, thought I was their sister instead of their mother. Most people still say I do not look my age of 46. However, 2 years ago I was diagnosed with my second auto-immune disease (this time a rare one) and since that day I have been diagnosed with countless more that are taking their tole on me. That’s neither here nor there, the fact of the matter is a healthy diet, lifestyle, and taking care of ourselves both inside and out goes a long way in the type of life we able to live while on this world.